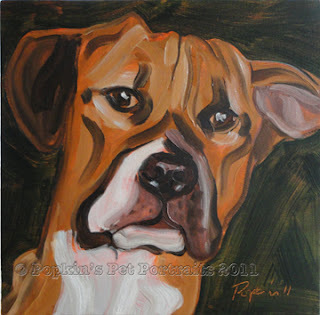 Popkin's Pet Portraits: Returning Customer! Remember how excited I was to get my first commission based solely on my Yelp! review and website? Well, Charlie came back for another painting! This time it was of his own dog Satchel, also known as Mr. Spirit. Satchel was a pleasure to paint and it was fun to see Charlie again and chat about science. I have just recently added this 10"x10" portrait size as a lower cost option and I am quickly coming to love it. The size allows such freedom of brushwork, requiring a gestural spontaneity- it's very freeing!